New York and Irish music have a long and storied history together, a collision of two cultures that results in bedlam, beauty and a lot in between. Shilelagh Law embodies all that is New York Irish music: old songs, new songs, jigs, reels, dancing, weeping, lots of laughter, plenty of drinks and great food. By interpreting traditional Irish music through a filter of urban grittiness, Shilelagh Law helps to define the Irish-American experience that is such a part of New York town. 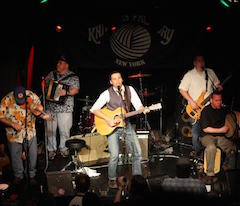 Everyone had such a great time with Shilelagh Law's first performance here, we're all looking forward to another round!